I’m sure you’ve heard of the saying “If you think dogs can’t count, try putting three dog biscuits in your pocket and then giving your dog only two of them.” (quote by Phil Pastoret). Well it’s true! Dogs can really count. And if you still don’t believe it, watch the video below! A guy holds up one treat in front of three Boxers. And just like any other dog, these three are all staring at that single treat! 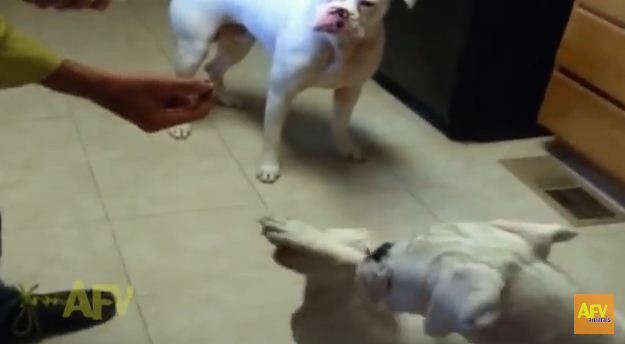 These dogs know there’s only one treat, and there’s three of them. They’re probably thinking which of them is gonna get the treat! But one of them is not gonna sit around waiting. Nope, he’s gonna do something to increase his chances in getting the treat! Watch the video below and see what he does!